1 of 4 Heat oven to 350 degrees . In a small bowl, whisk together cilantro, lime juice, olive oil, shallot, garlic, salt and pepper. Place fish in a shallow baking pan and pour on cilantro mixture. Bake at 350 degrees for 12 minutes or until fish is opaque and cooked through. Transfer 4 of the fillets to a lidded container. Cover and freeze for Friday. 2 of 4 Meanwhile, microwave frozen vegetables according to package directions, about 4 to 7 minutes. Divide vegetables in half. Place 3/4 cup in a lidded container; refrigerate for Friday. 3 of 4 Heat 2 inches water in a pot set over high heat until boiling. Top with steamer basket, add snow peas, cover and steam until crisp-tender, 4 minutes. Transfer 3/4 cup to a lidded container. Cover and refrigerate for Friday. 4 of 4 Microwave rice until warm, 2 minutes. Stir in remaining half of mixed vegetables. 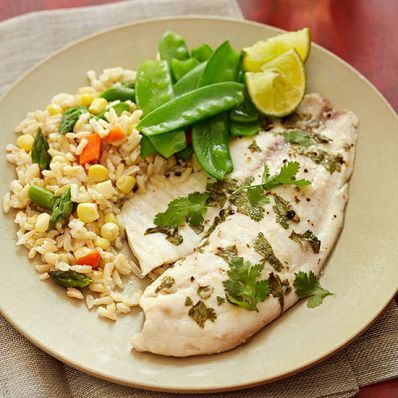 Serve with remaining snow peas and tilapia. Garnish with lime wedges and cilantro, if desired.